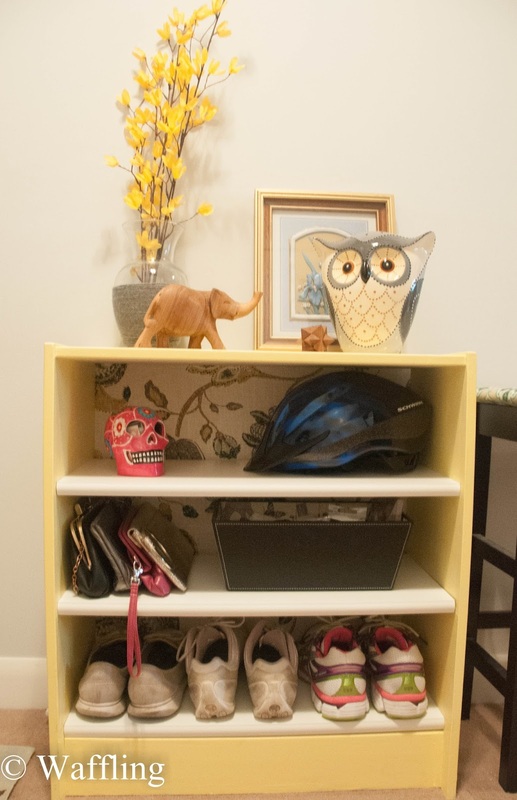 Waffling: Rast Dresser to Bookshelf! I am so excited to share a project I did this weekend! 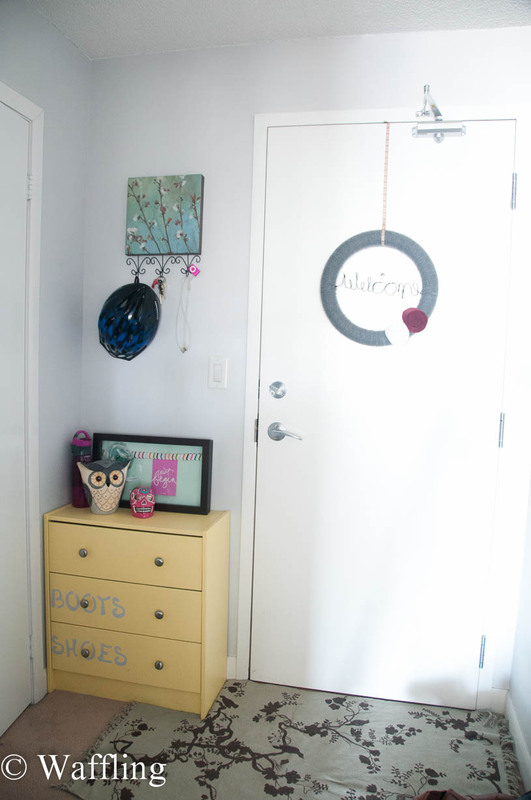 Now, if you remember, I used to have a yellow dresser in my front hall that was used to store shoes and boots. However, this fall I replaced it with a table because the drawers of this dresser were rather useless. I found them stiff and too shallow for my giant shoes (I wear a size 9.5!). I did not get rid of the dresser, but instead moved it to another wall in the front hall. And there it has sat for the past couple of months while I figured out what to do with it. 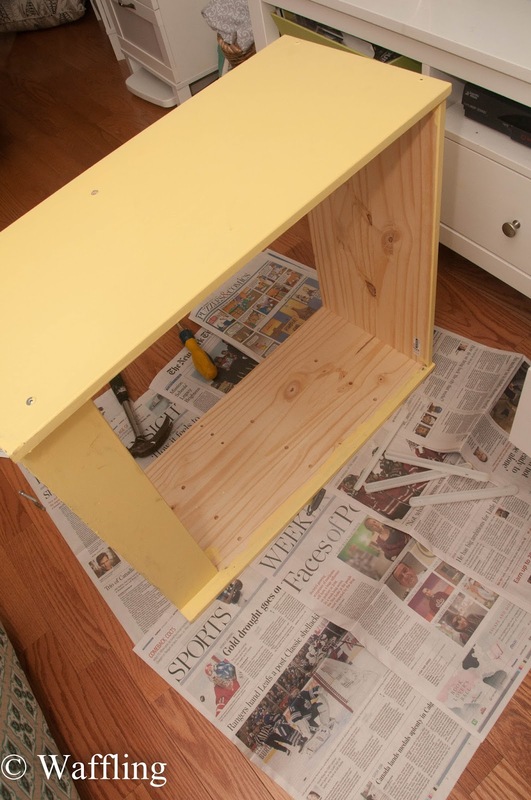 I liked the yellow and I still needed storage in this area. I finally decided- this thing needs to become a bookshelf to store items in! The only issue I had was that the shelves would need to be 11" deep and 23" long- not exactly a standard shelf size and I have no means of getting or cutting wood. So the project sat. But then one day I decided to google 11"x23" shelves and I found some. At SEARS of all places!!! And for only $8 each! So I ordered those suckers and they came within just a few days- super duper awesome!! This weekend I got to work pulling out all the pieces I did not need (backing, drawers, and a brace piece). I then got down to the task of filling all those holes with spackle and sanding it out. 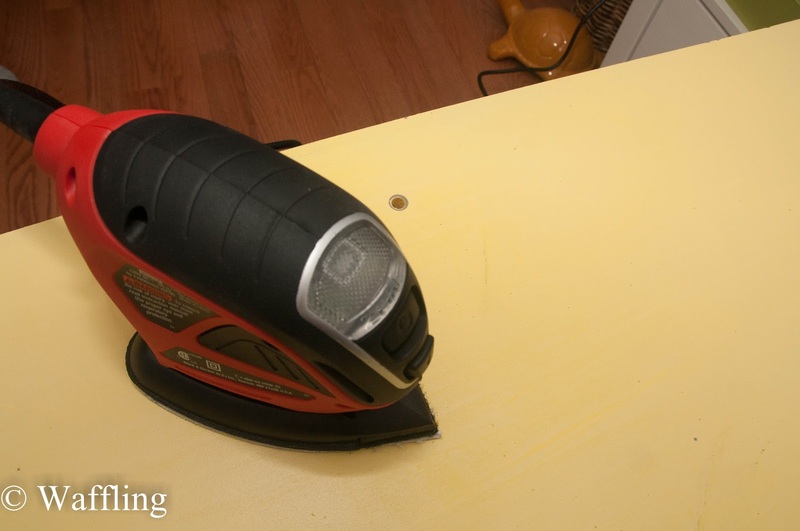 I actually got a little Black and Decker Mouse Sander for Christmas and it was SO handy. Sanding with this thing was a breeze. 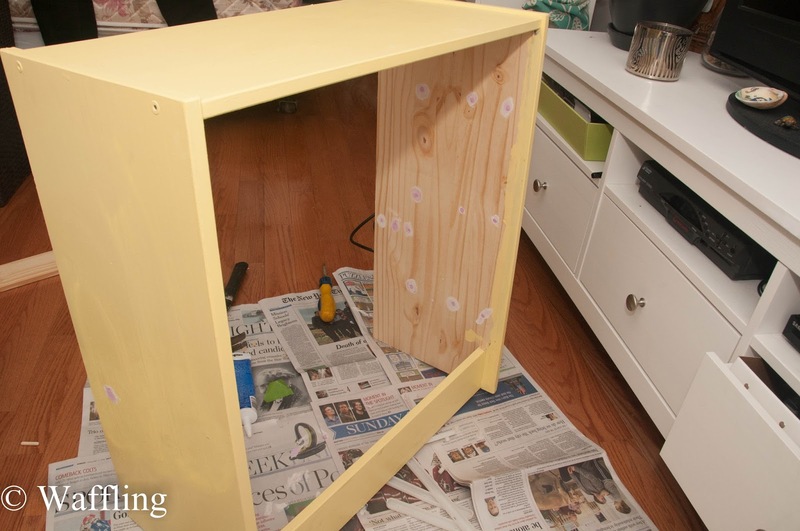 After this was completed I painted the inside of the dresser yellow to match the outside. Once that was all dry I got to work installing the shelves. They were horrible to install. 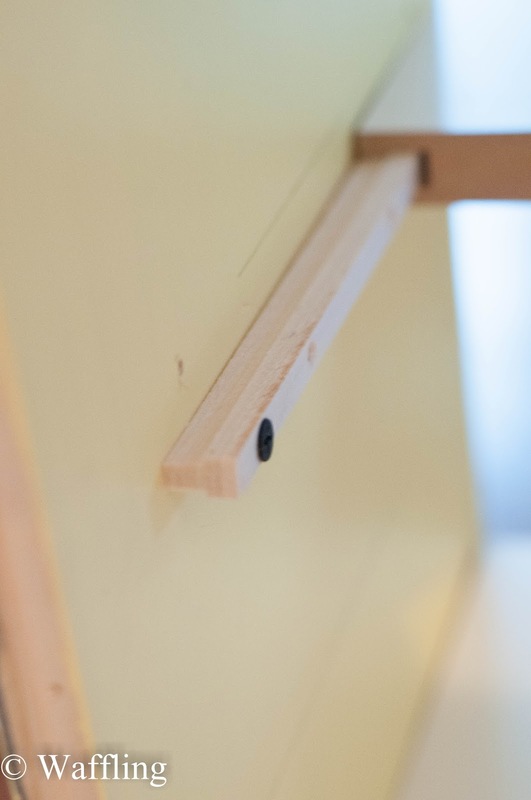 At first I thought this would be easy because they were well suited to my project as they come with a small brace for each side and then the shelf slides in, so it is floating. However the shelves ended up being a tiny bit too wide (ahem, not 23"!) so it was very tough to slide them onto the brackets! Literally I would throw my whole weight on them and they would move an inch, Plus you need to make sure your two brackets are perfectly level and let's face it- my measuring skills are not the best. Also the dresser the dresser is cheap and the wood is not at all even. 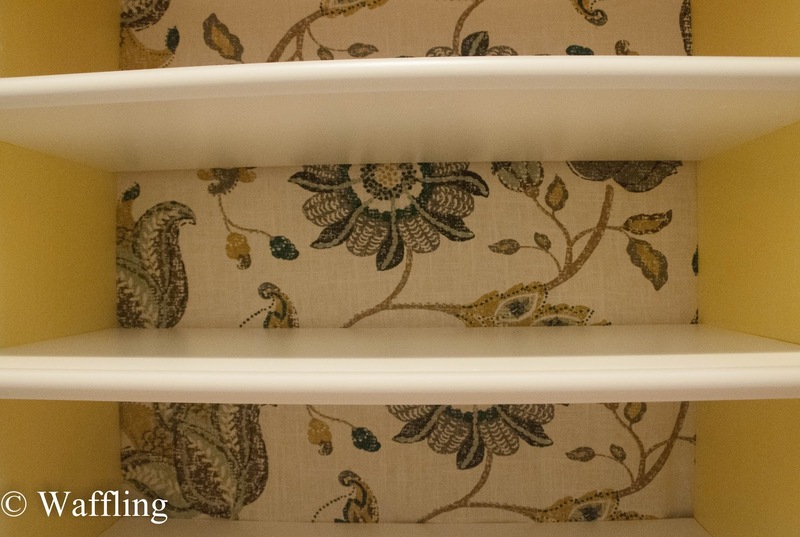 I did find that detaching the side of the dresser helped give the shelves a bit of breather room to slide in. Finally I got all three shelves in and the dresser sides reattached. After that I attached some fabric to the back to finish it off! 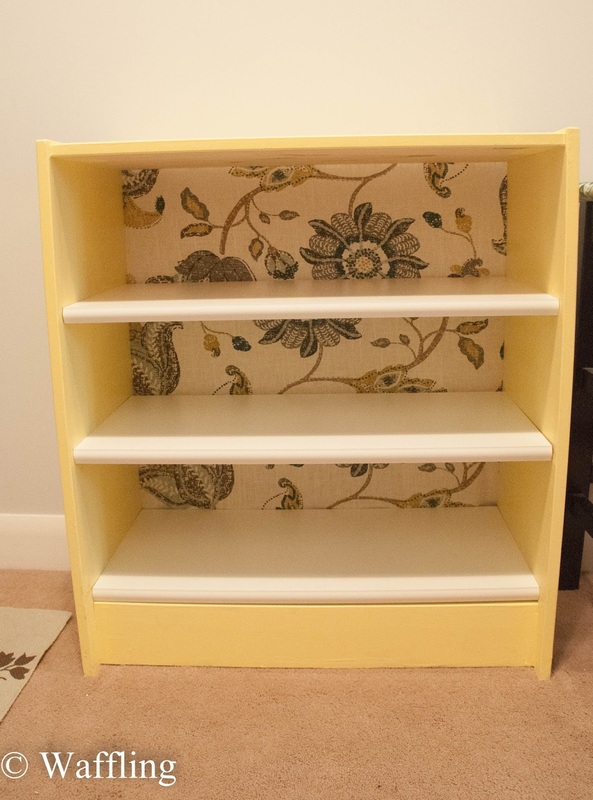 I chose this one because I thought it helped tie in the yellow bookshelf with white shelves (I didn't want to paint the shelves as the finish it came with is better for cleaning, however I was worried yellow + white would look too eggy on its own). I didn't have a big enough piece to cover the whole back so I did it in strips. Then, of course, I went ahead and styled it up a bit with stuff from around the condo! I planned to use the bottom shelf for my often-used shoes, but the other shelves may change up with the seasons. It is certainly not perfect, but I simply LOVE it! The extra storage is great and the bookshelf is cute to boot! What a fab DIY, and that fabric is amazing. Love it! Love your fabric. Great job...love how it can be transformed and still be so useful. What a great idea! And love how you embellished it with some beautiful fabric! Clever you! And I love the fabric backing! What a great DIY! Great makeover! Love the fabric at the back - great idea! This is great! You have guts to go for it on projects like this! Great upcycle! And I agree the fabric back totally makes it. Very clever! I love to see products being reused creatively rather than tossed out. That is gorgeous, what a great look! Cute! I love the fabric you used in the back, really pretty. I love the look of this! The fabric backing is so pretty :) Also, so glad to hear that sander is working nicely!! I got the same one for Christmas and have been itching to try it out but haven't had a chance yet.